Gynura procumbens is a plant in the Daisy family, that has the common name of 'Longevity Spinach'. It is native to China, Southeast Asia, and parts of Africa where it is known locally as 'Sambungal' or 'Sambung Nyawa' which translates into English as "Life Extender". It is a fast growing, herbaceous, perennial plant that makes an excellent micro-green! 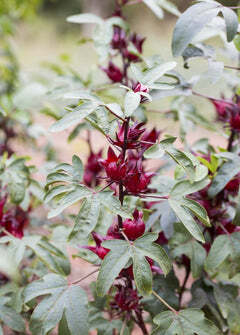 This tropical and sub tropical plant tolerates a variety of different soils, but grows best in the shade. It will produce excellent green leaves and tubular dandelion like flowers. This plant grows easily and readily from cuttings! Longevity Spinach has several uses including culinary and medicinal. The young leaves and shoots of the plants are generally the consumed edible parts of the plant. Gynura procumbens has been studied and assessed for it's reported abilities to regulate insulin levels, cholesterol, and blood pressure. Research has shown that compounds in the plant are antimicrobial, anti-carcinogenic, and anti-inflammatory. It is also sometimes used as a ground cover in gardens and farms for chicken and other livestock.